The SNJ, by North American Aviation, a two-place advanced trainer, was the classroom for most of the Allied pilots who flew in World War II. Called the T-6 Texan by the Army Aircorp, the Harvard by the RAF, and affectionately known as "the pilot maker" by its crews, the SNJ was designed as a transition trainer between basic trainers and first-line tactical aircraft. In all, the SNJ trained several hundred thousand pilots in 34 different countries. A total of 15,495 of the planes were made. 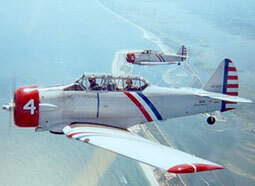 Though most famous as a trainer, the SNJ also won honors in World War II and in the early days of the Korean War. This remarkable and versatile aircraft was an evolution of the company's BC-1 basic combat trainer, which was first produced for the U.S. Army Air Corps with fixed landing gear in 1937 under a contract that called for 174 planes. It was designed by North American as a low-cost trainer with all the characteristics of a high-speed fighter. Although not as fast as a fighter, it was easy to maintain and repair, had more maneuverability and was easier to handle. 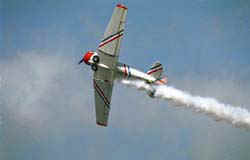 A pilot's airplane, it could roll, Immelmann, loop, spin, snap, and vertical roll. 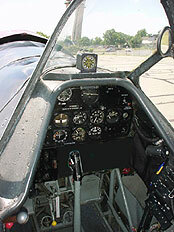 It was designed to give the best possible training in all types of tactics, from ground strafing to bombardment and aerial dog-fighting, and contained such versatile equipment as bomb racks, blind flying instrumentation, gun and standard cameras, fixed and flexible guns, and just about every other device that military pilots had to operate. The Skytypers of New York operate the SNJ-2 version, which is the only model with the enlarged, 180 gallon fuel tank, allowing the skytypers to operate for over four hours, skytyping messages throughout the day. In addition, the aircraft is eight inches shorter than the other variants, has a bigger, round rudder, and a non-steerable tail wheel. There are only eleven of these airplanes in the world, and the Skytypers have six of them. Dimensions: Span: 42 feet 1/4 inch; Length: 28 feet 11-7/8 inches. Engine: Pratt & Whitney Wasp R-1340-AN-1 550-horsepower, air-cooled. Speed: 205 mph (TAS) at 5,000 feet; climb speed-140 mph; approach speed-110 mph; stall speed (clean)-74 mph. Crew: Two pilots, flown solo from the front cockpit only.